Is it possible they built their machines too well…gave them pride and a desire to survive? Machines that wanted order and logic and found that frustrated by the illogical emotional creatures that built them? Our world is characterized by rapid technological change. The root cause of this is the need for economic growth. This quest for growth, however, is relatively new in the long history of homo sapiens, who, for scores of millennia, roamed the Earth ingesting its fauna and flora. After the end of the last ice age, some 12,000 years ago, during the Neolithic Revolution, humans learned to domesticate nature’s bounty and settled down. Thanks to bronze (and then iron), they created cities. An economic-political system of imperial agrarianism reigned for about six thousand years. But gunpowder technology and European rivalries then produced the Commercial Revolution. Running from about 1500 to 1800, this new system saw the rise of nation-states, global trade, innovations in financial products and markets, and a new business form—the corporation; this was combined with the commercial application of scientific discoveries. Mercantilism gave way to the Industrial Revolution—the use of mass mechanical production methods to satisfy the needs and wants of homo sapiens. The factory and new sources of energy created the modern capitalist system, where, economic growth was required to sustain itself, since competition demanded a continued return on invested capital. Before then, no one expected, nor required, economic growth. For the most part, imperial agrarianism was a zero-sum game of one empire winning at the expense of another. Growth in total output came mostly from expanding cultivated lands, rather than increasing the productivity of individuals. Because of continued economic growth and technological change, the Industrial Revolution, at least in the West, pivoted in the late 20th century. It has given way to post-industrial capitalism, marked by the manufacture of intangible goods and services. What economic revolution will come next? Likely some form of post-capitalism, where products are produced instantaneously on demand, and innovations in transportation, communication, and energy may render many forms of trade and labor as obsolete. There’s no iron-clad law that says that economic evolution must generate improvements in the quality of human life. Economic growth followed by economic collapse, for example, lead to World War II, and untold death and destruction. While it seems we may have learned from past mistakes, there’s no guarantee that we are out of the woods: tribalism, and the hate that it thrives on, is resurgent; tribalists and autocrats are exploiting technologies, like the internet and social media, that were supposed to improve our lives. Yet despite these warnings, the sprint for more powerful cognitive machines—and the economic growth they are intended to engender—is as feverish as ever. Just this past week, President Trump signed an executive order laying out a plan to boost AI technology, “amid growing concern that the U.S. is losing out to China.” The combined forces of business competition; the deeply ingrained nature of computerization in our society; and the perpetual quest for knowledge and technological advancement, bring us closer and closer to a world where machines can think for themselves. Arguably, the late 1960s represents, in the U.S. at least, peak industrial capitalism. As computers began to seep deeper into our lives, futurists could begin to envision the possibilities and pitfalls of our collective future. Enter Star Trek. The show’s creator, Gene Roddenberry (1921-1991), and the team of writers, imagined a post-capitalist world, where markets are marginalized, and humans no longer need, or want, to engage in cut-throat competition. Released from the drudgery of work and the treadmill rat race, people are free to seek knowledge and explore space, the final frontier. With the elimination of poverty, hunger, and want, humans finally achieve utopia on Earth through rational thought, mutual understanding and trust, and a reasonable use technology. But only if they learn from the mistakes of the past and if they are not consumed by the very technology that enables the good life. The idea that artificial intelligence could destroy our society is not new. At least since the computer was invented, dramatizations about their power began to be appear in movies, television, and novels. But Star Trek is particularly important because each episode offers a thought experiment about what could befall humanity if it is not careful. During the run of the original series (TOS), from 1966 to 1969, Captain James T. Kirk and his crew on the USS Enterprise, in the 23rd century, traverse the galaxy on a five-year mission of exploration and peace. In their journeys, they encounter situations and societies that present ethical, moral, and physical dilemmas for the crew and humanity more broadly, including several (inherent?) paradoxes created by artificial intelligence. In S2:E24, The Ultimate Computer, computer-science genius, Dr. Richard Daystrom tests his AI machine on the Enterprise. Good intentions go awry when the machine starts shooting at other starships. Captain Kirk uses logic to save the day. I would argue that, in particular, there are four key fears about computerization that run through series, though they can be reduced to two basic themes: first is that AI and self-aware machines will protect themselves at the expensive of people; and second is that we will become so dependent on intelligent computers that we will become infantilized—the machines will remove from us the very elements that make us human. We will, in short, become the domesticates (if not outright slaves) of the very machines that were produced to help us. In several episodes, the Enterprise encounters intelligent machines. Once the computer becomes aware of its own existence, its primary mission changes from its original programing to that of self-preservation. 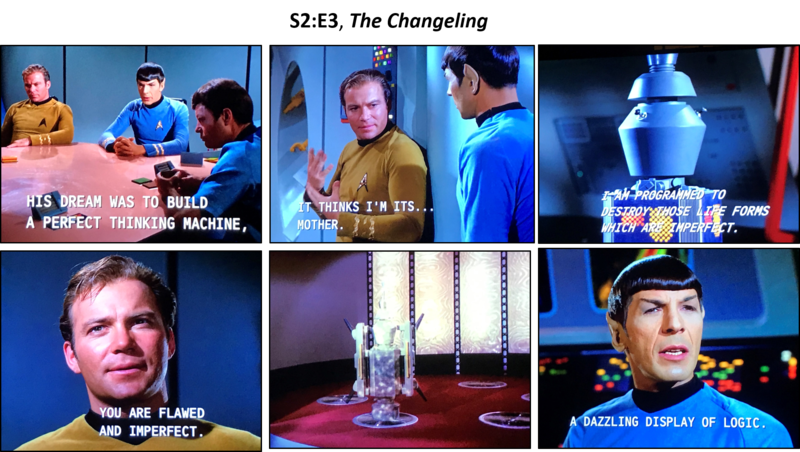 In S2:E24, The Ultimate Computer, computer-science genius, Dr. Richard Daystrom, is given the opportunity to test his new AI machine, the M-5, on the Enterprise. The computer is to take control of the ship and engage in war games with other federation starships. When informed of this new policy, Kirk becomes vexed—it now seems the computer will render his job obsolete. But once the machine is switched on, it becomes increasingly intelligent and realizes that in order to carry out its mission it must fight for its survival. War games morph into actual battles as the machine fires live weapons at the other ships—killing hundreds of crewmen. The victimized ships are forced to consider destroying the Enterprise in return. 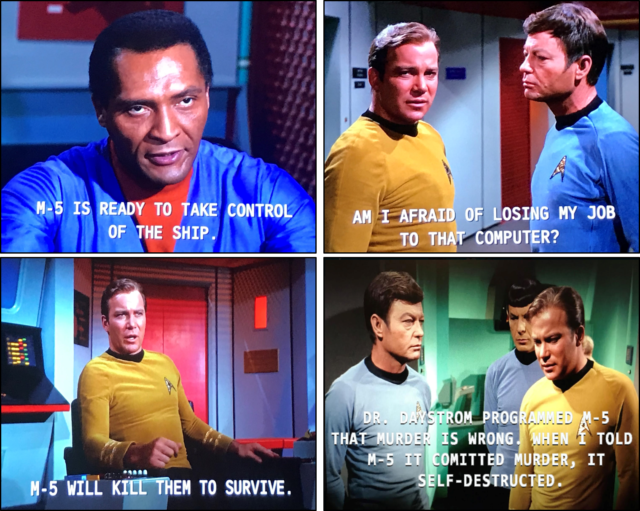 Kirk eventually learns that the machine is programmed with the morality of its programmer, Dr. Daystrom, including the belief that murder is “an offense against the laws of God and man.” Kirk, using his mastery of rhetoric, tells the computer that it is programmed to both murder and not murder at the same time. Unable to resolve the paradox, the computer shuts down and Kirk regains control of the ship. In S1:E21, The Return of the Archons, the crew of the Enterprise beams down to a planet where the residents wander around in blissful trances. 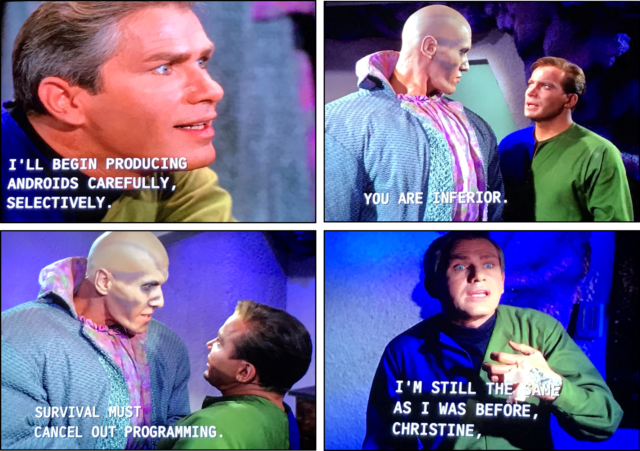 Captain Kirk discovers that a computer, named Landru, is programmed to bring order to the society. Kirk causes the computer to self-destruct when he convinces it that it’s harming the very people it was designed to protect. In another set of episodes, humans are not only robbed of their humanity, but have also retrograded and are unable to think for themselves. In each of the shows, in the long past, a computer was programmed to help run the society. But the machine becomes the Great Leader, with the power to enforce laws and norms, and provide for the people’s needs and wants. Over the years, as the species devolve, they retain no awareness that it’s god is a machine. In S2:E5, The Apple, the crew of the Enterprise arrives on a planet that seems a veritable Garden of Eden. They eventually capture a local, who is also the chief priest of their god, Vaal. Each day the villagers must appear before the mouth of Vaal and feed it with fruits and vegetables. This is their life—a simple, but pleasant existence—in good health and ignorant bliss. But Vaal is also trying to destroy the Enterprise by pulling it down from its orbit. Kirk and Spock learn that Vaal is a computer that controls the society through its priest. Kirk is now faced with a dilemma: save the ship and kill the machine or keep the society intact and let the Enterprise be destroyed. Another idea, intimately related to Fear 2, is that culture and society will be greatly perverted by its fetal attachment to the machine. In other words, the computer causes the norms and rules of society to produce extreme or bizarre behavior among its citizens. Arguably, the distinction between infantilization and perversion of culture is somewhat arbitrary. But in the first case, the episodes illustrate how the computer can make us like children. In the second case, the episodes illustrate how the computer can cause pervasive fear and violence. In S1:E21, The Return of the Archons, the crew arrives on a planet to find that nearly everyone exists in a kind of soulless trance; though during the “Festival” or “Red Hour” they succumb to violent rages against each other. While in their trance, they feel peace and joy—a contentment brought on by the good graces of their god, Landru, who is, once again, pulling the Enterprise down from its orbit. A small band of rebels, unaffected by Landru, lead Kirk to the source of its power—a hidden computer. In S1:E7, What Little Girls are Made Of?, exobiologist, Dr. Korby, discovers a planet where the old residents–long gone–were able to produce androids. But the androids killed off the old ones when they realized they were imperfect creatures. Korby learned to transfer his being to android form before he died and hoped to do the same with other humans. In the end, the android Korby kills himself when he realizes that android and human societies are inherently incompatible. In S1:E7, What Little Girls are Made Of?, the crew finds the lost exobiologist, Dr. Roger Korby, living in underground caverns on the icy planet of Exo-III. He had disappeared some five years before on an investigation of that planet. Upon arriving, Kirk is informed that “Dr. Korby has made some fascinating discoveries.” In particular, he discovers that the ancient dead society had built near-perfect androids. Korby learned that he can replicate people into android form to create immortal humans, who no longer suffer from hunger, disease, or death. It became necessary to destroy them. You are inconsistent. You cannot be programmed. You are inferior….That was the equation! Existence! Survival must cancel out programming. We also discover that Korby is not a human but had transferred his self into an android body before dying of hypothermia. In the end, we see that the existence of “perfect beings” is also incompatible with human society. Humans are messy and imperfect. They cannot coexist with those whose sole purpose is perfection and order. Ruk is killed by Korby to protect himself; and then Korby kills himself and the last remaining android when he realizes his dream of the creating the perfect human is impossible. The key theme of all these episodes is the apparent incompatibility of human society and self-aware machines. Captain Kirk’s repeated use of logic to disarm the computer illustrates the paradoxes of allowing our machines to have human abilities. Humans will have one agenda and the machines will have another. Disarming machines with logic won’t be so easy. The whole point of AI is that programming adapts and learns from its past experiences to become more efficient at solving problems. In addition, programming that seemingly has an objective objective can take on the biases and subjectivity of its programmers. Self-aware machines can thus easily exploit the tribal tendencies within people that have driven them to repeatedly turn on each other. While elements of Star Trek seem dated and simplistic, it remains timely because it continues to engage in a dialogue about the possible consequences of being so dependent on upon our computers. Our headlong rush into AI for the sake of economic growth, productivity, and efficiency cannot be taken so lightly. Our current retreat into tribalism, and the attempts to deny our collective problems, are slowing down—if not outright stopping—our ability to have real conversations about our future. We are forced to endure manufactured crises while the real one’s fester. If we don’t confront our possible future today, we leave it up to chance and the fate of unintended consequences. But perhaps we can end on an optimistic, non-dystopian note. By the 24th century, humans have appeared to solve the AI crises of the 23rd century. Aboard the USS Enterprise—captained by Jean-Luc Picard—is the android, Lieutenant Commander Data. His biggest challenge is not how to best destroy humans, but rather how he can become more human. Perhaps Star Trek: The Next Generation can offer lessons on how humanity can peacefully co-exist with its machines. But this is a subject left for a future post. Note this is Part II of a (hopefully) on-going series on Star Trek and the economics of our future. Part I can be read here. In fact, we are no longer a human society but rather have become a human-computer (humputer? compuman?) society. As I have argued in a previous post, social scientists can play a role by offering policy suggestions. One way to do this is to model science fiction scenarios using mathematical modeling and computer-based simulations, such as agent-based modeling (ABM). If you are a social scientist interested in using ABM for futurology, send me an email; I would be interested in talking more. You are a barbarian….Don’t sound so incredulous, captain. We all are. A killer first, a builder second. A hunter, a warrior, and—let’s be honest—a murderer. That is our joint heritage, is it not? Here in the 21st century, it is clear that the Homo sapiens of Planet Earth are moving inexorably towards one common global community—a Terran Community—rather than a series of independent nation-states. While we may retain a sense of our individual identities, just below the surface is our umbilical attachment to the great web of technology, trade, and civilization. This web is growing exponentially—intensively and extensively—whether we like or not. Yet, despite the forces driving humans closer together, they possess an instinct to form social boundaries—to define who is part of the group, and who is an outsider. For example, people are programmed to protest against real or perceived preferential treatment of one person or group over another—perhaps as a self-preservation mechanism. Today, economic growth and trade have replaced empire and warfare as the main methods of acquiring resources. While we believe we are “buying” ourselves peace through increased consumption and bonding with our computers, we still have no idea where our technology will eventually take us. In the desire for profit, individuals and companies are seeking to demolish the costs of production, communication, and transportation. Thus, global capitalism appears to be moving us toward two possible outcomes. First is that work, as we know it, could be eliminated for a large fraction of the population. But, if the distribution of wealth is highly unequal, the rest of the population will either be unable to find meaningful employment or will be forced to perform drudge work. Second is the instantaneous movement of people, information, and goods and services (either in reality or virtually), which means the near-total elimination of the kinds of boundaries that people seem to require. The question remains: in what direction do we go? Do humans use their technology to sequester themselves into tribal and economic silos and then turn on each other; or to they use technology to maintain a high quality of life for all? While the events of human history, from the rise of the earliest city-states, to the Roman Empire, to the American Revolution, to Word War II and the Cold War, can offer lessons on how humans have struggled to balance these two opposing forces, we can also learn these lessons from our future, or, rather, from our hypothetical future. 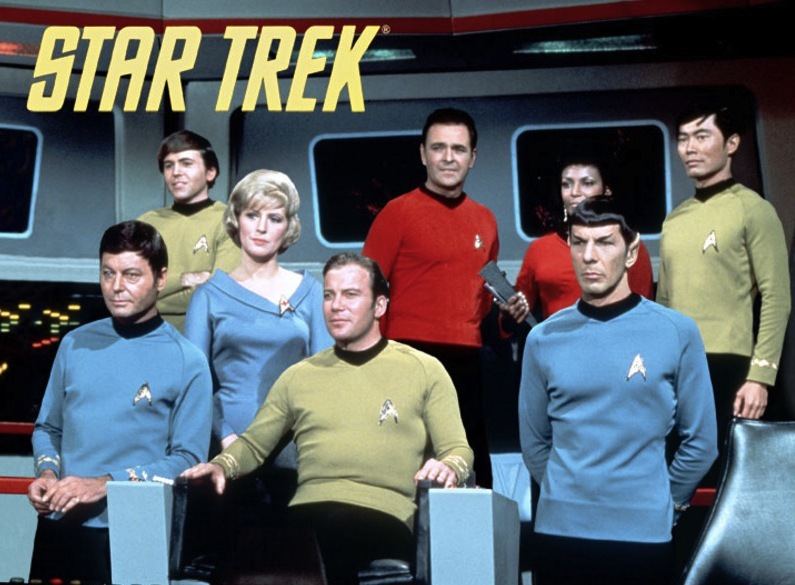 In 1967, the world was introduced to Star Trek. In the original series (TOS), in the 23rd century, the crew of the U.S.S. Enterprise, led by Captain James T. Kirk, traverses the galaxy on a five-year mission of exploration and peace. During the 24th century, in the Next Generation (NG), Captain Jun-Luc Picard commands the Enterprise in its continuing mission to seek out new life and new civilizations. The series has excited the imaginations of countless humans (and humanoids) alike. The show’s creator, Gene Roddenberry (1921-1991), offered a depiction of the future that was, in many ways, prescient. The series holds up a mirror to ourselves, while also offering a possible mirror for our future selves. It tackles issues of war and peace; identity and the self; automation and artificial intelligence; and how to live in a world where economic walls have been destroyed by technological progress. Roddenberry’s vision, unlike much of modern science fiction, is relatively upbeat. The word “utopia” is frequently bandied about in reference to the future humans of Planet Earth (a/k/a Terrans). Through the lens of science fiction, the show offers possible models or simulations of what tomorrow could look like, providing lessons on how to balance our opposing impulses of Tribalism and Terranism—or at any rate—possible scenarios if we don’t. One of the show’s visionary elements was the economic world it portrays. Since we are likely headed to some version of this future, we can look to the show for guidance. As Manu Saadia highlights in his book Trekonomics, the Star Trek universe is characterized by several key features. First is the elimination, or near elimination, of marginal production costs. Food synthesizers (TOS) and replicators (NG) eliminate material scarcity. Warp drive (at faster than light speed) and transporter beaming mean that people and goods can move anywhere at any time. In 24th century world of Picard, money is gone. With nearly everything immediately replicatable, there is no need for trade, and, thus, currency melts away. The economics of work—suffering a disutility in exchange for money that allows one to buy goods and services that return a higher utility—is gone. The society offers the freedom to pursue art, science, philosophy, or exploration. Since pining for money is irrelevant, career success is based on reputation, merit, and effort. The economics of the future is somewhat different….You see, money doesn’t exist in the 24th century. The acquisition of wealth is no longer the driving force in our lives. We work to better ourselves and the rest of humanity. But across the galaxy, the elimination of work may only be for some. Without money, the incentives to perform important but necessary manual labor are gone. This leaves the possibility that it is done through force. The episode, TOS:S3:E21, The Cloud Minders, serves as a warning that a strict two-tiered society can easily evolve. On Ardana, there are those who live the intellectual life high up the floating city of Stratos. On the surface are the oppressed Troglytes, who are forced to do the labor to support the thinkers in the city. This troubled planet is a place of the most violent contrasts. Those who receive the rewards are totally separated from those who shoulder the burdens. It is not a wise leadership. Here on Stratos, everything is incomparably beautiful and pleasant. The High Advisor’s charming daughter Droxine, particularly so. The name Droxine seems appropriate for her. I wonder, can she retain such purity and sweetness of mind and be aware of the life of the people on the surface of the planet? There, the harsh life in the mines is instilling the people with a bitter hatred. The young girl who led the attack against us when we beamed down was filled with the violence of desperation. If the lovely Droxine knew of the young miner’s misery, I wonder how the knowledge would affect her. The Troglytes resort to violence and terrorism to fight their plight. This further convinces the cloud city residents that Troglytes are inherently inferior, unworthy of the good life in Stratos. In the end, through Kirk’s “cowboy diplomacy” the Troglytes receive help, and the episode ends on an optimistic, if unresolved, note. 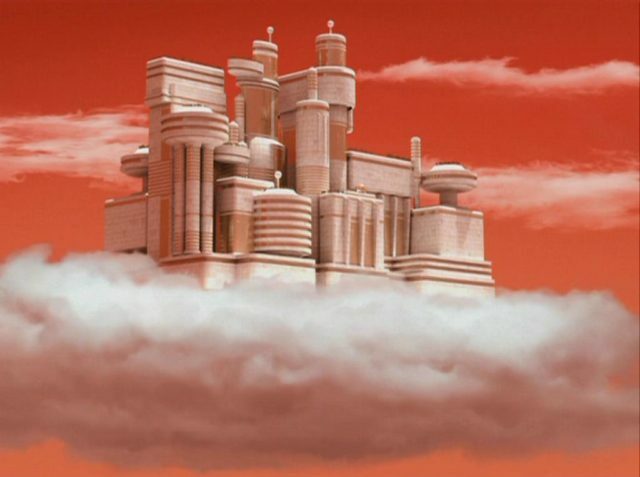 The Cloud City of Stratos (TOS:S3:E21). On Earth, however, a world of universal peace and enlightenment did not come easily. With its technology, Homo sapiens was forced to confront a choice: it could either destroy itself completely or use its technology to free itself from its baser instincts. The episodes frequently refer to World War III (e.g., TOS:S2:E25, Bread and Circuses; TOS:S1:E21, Space Seed; NG:S1:1E, Encounter at Farpoint) and how the aftermath finally pushed humans to put aside their tribal attitudes and cooperate for the greater good. Admittedly TOS was written during the height of the Cold War, when Mutually Assured Destruction was a looming threat. Though global annihilation from nuclear war is less likely today, the underlying desires and characteristics of humans have not changed all that much. The series contains a running dialogue with itself about whether humans can suppress their instinctual desires to debase, dehumanize, and attack each other. Captain Kirk takes great delight in reminding those he encounters that humans have achieved peace and harmony by suppressing their killer instincts. The relative peace on Earth and among the United Federation of Planets allows other humanoid species to act as foils—to demonstrate the consequences of not overcoming tribalism. Two episodes offer good examples. In TOS:S3:E15, Let That Be Your Last Battlefield, the Enterprise captures an unusual looking humanoid, Lokai, who is white on the right half of his body, and black on the left. This “checkered” individual is fleeing his home planet, Cheron, and demands asylum from his pursuer, Commissioner Bele, the Chief Officer of the Commission on Political Traitors. The two individuals appear to be quite similar; yet upon closer inspection, Bele is white on the left and black on the right. These seemingly minor differences are the seed for deep-seated hatred and segregation. The two are locked in an intergalactic game of cat and mouse. Bele demands Lokai face justice for his crimes as a revolutionary and instigator. Lokai demands freedom for his people. In the end, the antipathy of the two “races” proved too great. Upon returning home, they see that nothing is left; all was destroyed by war. The final scene shows the two running in horror through the empty streets, with absolutely nothing, except their hate. Bele and Lokai in TOS:S3:E15, Let That Be Your Last Battlefield. In TOS:S1:E:23, A Taste of Armageddon, the Enterprise arrives (unwelcome) on the planet Eminiar VII, only to discover that the residents are waging a computerized war with rival planet, Vendikar. Rather than fighting with real weapons, the two societies use computers to simulate attacks on each other. But simulated casualties are then translated into real ones. “Killed” residents must report to disintegration machines to be executed. Kirk’s ultimate action is to destroy the computer—let them either face the horrors of a real war directly or find a way to make peace. We’re human beings with the blood of a million savage years on our hands! But we can stop it. We can admit that we’re killers . . . but we’re not going to kill today. That’s all it takes! Knowing that we’re not going to kill — today! While Homo sapiens, in the 21st century, appears to be using its technology and wealth to overcome its natural tendency toward violence, there are no guarantees for the future. The proclivity to create boundaries and to demarcate “insiders” versus “outsiders” is part of what makes us human. In uncertain times, political and economic entrepreneurs can easily exploit the desire to blame others, as they have done since time immemorial, and at the cost of countless lives. While capitalism can buy peace, it has not eradicated hate. Technological innovation has, and will, make hate increasingly destructive if not properly checked. But, envisioning our possible future through the world of Star Trek can offer us some lessons and hope. By simulating possible “dry runs” for our tomorrow, the series allows us to think wisely about how we can arrive there in a peaceful and rewarding manner, and to boldly go where we have never gone before. Continue reading Part II in this series on Star Trek and the economics of the future here. Despite the show’s prescience, it was still a product of its time. As result, it was not fully able to divorce itself from the various “isms,” including sexism and racism, that continue to plague us. Nonetheless, its diverse bridge crew and the open and friendly interactions with other humanoids and sentient species illustrates its forward-thinking nature. The disappearance of money in the 24th century strikes me as particularly utopian. As long as some resources are unevenly distributed throughout the planet or galaxy, and that some of these resources are privately held, there will be trade. As long as there is trade, there will be a need for money (or monetary units), even in a future where food, clothing, shelter, and pleasure are instantly obtainable. Hence the focus on gold-pressed latinum on Deep Space Nine. The Star Trek series is so fascinating because it unabashedly presents a utopian image of the future. This vision, first presented in the original series created by Gene Roddenberry, a known secular humanist, was then extended in the Next Generation and Deep Space Nine (under Rick Berman’s role as executive producer). Through the adventures of the U.S.S. Enterprise (classes A through E), we see what might be in store for us: that homo sapien sapiens can dispense with its baser instincts of greed, selfishness, and conflict (at least within the human community); and live in a world where material scarcity is eliminated. Life is simply a journey for the pursuit for knowledge: to explore strange new worlds, to seek out new life and new civilizations…. “To boldly go where no one has gone before” is, at its heart, a call for humanity to explore itself, and seek what might be possible for our modern society a century or two hence. But, lest we forget, utopia requires an economic system: a means by which goods and services are allocated in a way that frees us from harmful competition and the drudgery of the rat race. Enter Trekonomics, a book about the underlying economics of the Star Trek universe. It nicely parts the curtain, if you will, and shows the economic superstructure of this future. As such, it offers a lighthearted challenge for us to wrestle with the economic elements that will one day make up our future, and some of which are already here. 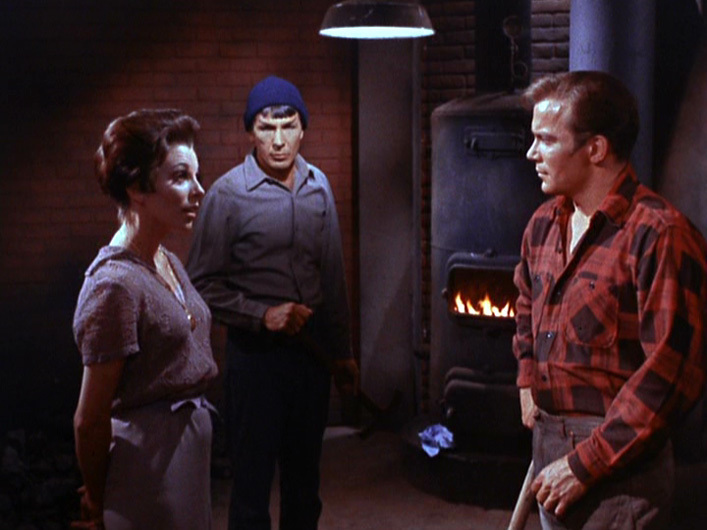 In City on the Edge of Forever (TOS:S1:E28), Kirk and Spock travel back in time to Depression-era New York. From that vantage point, they can see that, in the future, hunger, unemployment, and war have been eliminated, a dream of the social worker and humanitarian, Edith Keeler. The purpose of the book is to explore how Star Trekkian society holds together without the neo-classical economic world we take for granted. Saadia’s main argument is that we can understand this economy as comprised of four basic differences than our own: (1) the end of material want made possible with zero marginal cost of production and transportation; (2) the near-elimination of money; (3) the end of the labor-leisure trade-off; and (4) the benign exploitation of computers and technology. But Trekkies be warned: the original series (TOS) makes nary an appearance. The Star Trek economy of interest here is that of the 24th century, of Picard and Sisko; not that of the 23rd, of Kirk and Spock. In this regard, the presumption is that the TOS is simply a halfway utopia, a kind of stepping stone to the real one, since there is still money—Federation Credits—to buy tribbles, for example. This assumption is done for expedience because the technology of the 24th century is seemingly more advanced, and the “Economic Question” comes up relatively more frequently in Next Gen and DS9 (but which also features the latinum-lusting Ferengi, Quark). But, nonetheless, it was the TOS that made the idea of utopia possible and it would have been nice to see a greater exploration of the foundational economics. Captain Jean-Luc Picard: The acquisition of wealth is no longer the driving force of our lives. We work to better ourselves and the rest of humanity. Actually, we’re all like yourself and Dr. Cochrane. The disappearance of money is really a bi-product of the elimination of material scarcity. The replicator, Saadia argues, obviates our need to work and trade (though Deep Space Nine seems to negate this idea, as its existence near the stable wormhole makes it a classic port city). Without these needs, money and labor (i.e., utility reducing actions that buys leisure and goods) becomes redundant. Without labor, employment is voluntary, and social status and the respect from colleagues become the new currency. The desire for good reputation, Saadia argues, is the glue that binds society together. In First Contact, Captain Picard goes back in time to the 21st Century. There, he explains to Lily Sloane that the economics of the 24th century are quite different, including the elimination of money. Throughout the book, we get to understand the world of Picard, et al. without money or want, but, ultimately, the book is unsatisfying in that it only provides interpretations of what happens on the Enterprise and DS9, using the standard concepts taught in Economics 101. It makes little attempt to explain the inherent paradoxes or contradictions in the system. Let’s face it, we can only obtain the good life if we eliminate the unintended consequences of our actions. The road to utopia is littered with failed experiments big and small, from Socialism to the bevy of 19th century utopian communities. Here Star Trek proves more useful than Saadia lets on. The original series is filled with warnings. 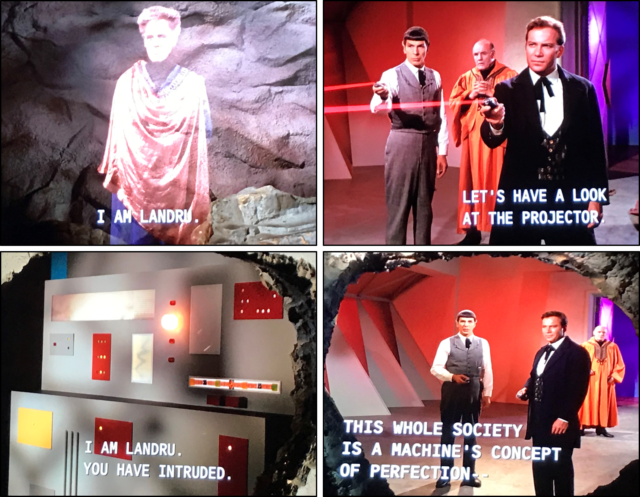 In The Cloud Minders (TOS:S3:E19), for example, a work-free utopian society exists above the clouds, while the laborers are enslaved in the mines below; in Return of the Archons (TOS:S1:E23), the society is dominated and stultified by a computer designed to protect it. In Let that be Your Last Battlefield (TOS:S3:E15), a technologically-advanced society cannot stop from destroying itself because of petty, meaningless racism. Or in The Ultimate Computer (TOS:S2:E24), the harmful effects of AI are on full display when a new computer program causes the Enterprise to fire on other Federation ships as means of self-protection. 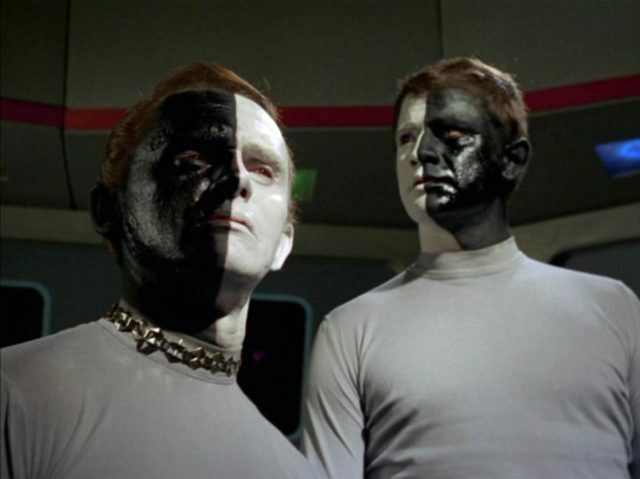 In Let that Be Your Last Battlefield (TOS:S3:E15), the residents of the planet Cheron destroy each other because of arbitrary and meaningless racism. Those with white on their right side are enslaved by those with white on their left side, and they ultimately rebel, leading to civil war and apocalypse. If we are to achieve utopia—where each individual is free to pursue, and achieve, a meaningful sense of well-being without harming others—then we must resolve the inherent paradoxes in any proposed system. Take the key question that we are only now beginning to face: the obsolesce of labor itself, as computers and robots make humans redundant. In Star Trek, with no money or want, no one need not bother working in the cramped Jeffrey Tubes, mine for dilithium crystals, or empty the septic tanks on the Enterprise. Furthermore, even though the replicator produces food and clothing, there are things that people still want that the replicator cannot produce, such as Chateau Picard, yamok sauce, or space exploration more broadly. Yet, the 24th century Federation prohibits robots from doing this production. But a future where no one needs to work produces a dilemma in that we cannot have both voluntary labor and unpleasant chores. If full automation frees everyone from drudgey, what then? Does everyone become an artist, vintner, scientist, philosopher, or space traveler? What if people simply refuse to make productive use of their time? The rest of society cannot move forward. Another alternative might be that everyone must do the crappy jobs for a while, as a form of public service, but this brings us back to the socialism problem, where people under-provide labor because there is no compensation proportionate to effort. To be ordinary in the future may well be a curse. Economists are wont to point out the robustness of democratic-capitalism—that it is capable of self-correction in times of trouble; the Great Depression and World War II were followed by the New Deal, the United Nations, and the rapid advance of the standard of living; resource scarcity is met with substitution and new technology. But, as the Trump Presidency illustrates, we are not out of the woods; the party in power seems determined to create class warfare and sow seeds of distrust among nations and ethnicities. Climate change presents another possible existential threat; while AI and self-aware machines still remain an unknown challenge. Deep Space Nine features the money-lusting Ferengi, Quark. In Trekonomics, Saadia argues that Quark and his Rules of Acquisition, represent us–capitalists in the 20th and 21st centuries. While Trekonomics does not address these issues, the book offers an interesting perspective and is worth reading for that reason. It provides an attempt to build a bridge between the dismal science and the imagined future. The next step is for social scientists and policymakers to seriously consider how we might achieve this world. Researchers can learn a lot from science fiction, which represents a form of social and technological simulation. Science fiction writers seed ideas, and inspire us to materialize (or avoid) them. The original series, for example, is credited with giving rise to the cell phone and the iPad. Scientists today are working on tractor beams and tricorders. 3D printing is a primitive replicator. But, just as importantly, science fiction is nothing if not the exploration of the unintended consequences of our actions. Through science fiction, we can envision utopia and the economic ideas that can create it, as well as the accidents that may enslave us in dystopia. In other words, we could imagine a world where science fiction writers and social scientists collaborate and learn from each other as a way to promote new, workable ideas. Trekonomics is a step in that direction. Now the challenge for social scientists and policymakers: engage, and make it so! Editorial Note: Though the Skynomics Blog is primarily focused on tall buildings around the world, I take a broad interpretation of this concept. Skyscrapers are built in an attempt to satisfy our needs and wants, and thus affect the quality of life and well-being. The fictional world of Star Trek is an imagined built environment and, as such, is worthy of discussion in this blog. Would it be a stretch to say that the U.S.S. Enterprise is a form of skyscraper?